The first time I stepped foot into the Bass Pro Shops Outdoor World I just kinda stood there in awe. This 170,125 square foot retail space seems to be more of a showroom than a store. Yes, you can buy things there but the live fish tanks, massive displays, and hundreds of taxidermy animals help make this place a Mecca for lovers of the great outdoors. 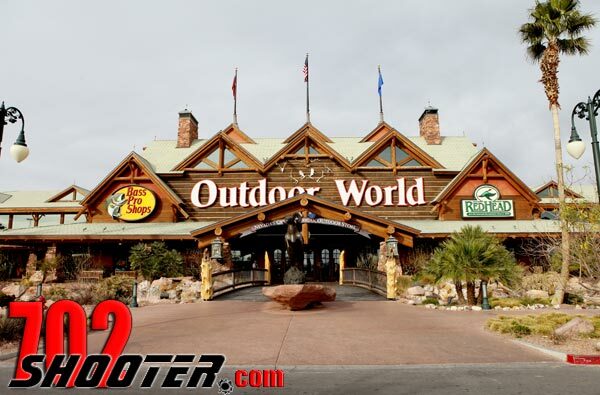 This awesome Outdoor World is joined at the hip to the Silverton Casino off I-15 and Blue Diamond Rd. just minutes from the Las Vegas Strip. If you decide to enter through the front door, be sure to exit through the side that enters into the casino. Although I overlooked photographing it, there is a beautiful indoor creek display that is well worth a few minutes of your time to check out. Back to the store itself…Did I mention this place is HUGE? Multiple departments featuring pretty much any outdoor activity you can think of. They also have an indoor boat showroom and sea of fish hanging from the ceilings above the fishing area. In any given section of this store you will find available workshops and classes. They have workshops to help you with your golf swing, learn to tie your own flies for fishing, and even concealed carry classes. One could spend hours just wandering through this place (and I have) but you will have to head upstairs to find what we came here for today. Need a new rifle? They’ve got you covered. Want to shoot that new rifle? They can assist you with that as well. Next to the well stocked gun counter is a small reception desk which houses a CCTV system that is used to keep track of the four indoor shooting lanes. There are two 15 yards lanes which will accommodate up to .500 cal handguns and an additional two 25 yard lanes for your rifles up to .300 cal. If you have a valid drivers license from any state and can legally be around firearms then you are welcome to use either of these ranges. Targets, ammunition, gun vaults, and even gunsmith services can be found here along with pretty much everything else you can think of. As I strolled through the aisles I found a number of interesting and useful items I have not seen in the basic sporting goods stores. The Archery section is equally equipped. Here you will find a variety of bows, crossbows, arrows, arm guards, targets, sights, etc…You will also find a 30 yard indoor archery range with five lanes. According to the sales person I spoke with, they will even allow you to try before you buy. Okay, I was there last summer with my son and I loved every minute of it. The place is awesome. I did spend some money there but I could spend a million there if I had it!